The small town of Erquinghem-Lys, a very short distance to the south west of Armentières, was occupied briefly by the Germans early in October 1914, before the British captured it on the 16th of the month. 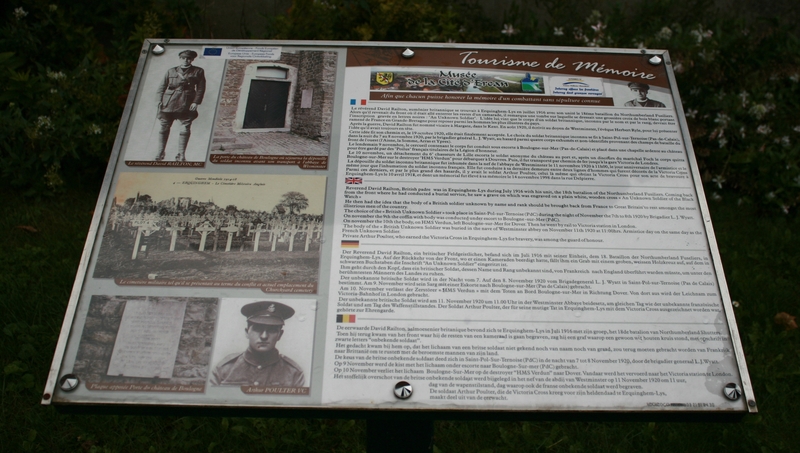 From then it remained a short distance behind the British lines until the German advance of April 1918. 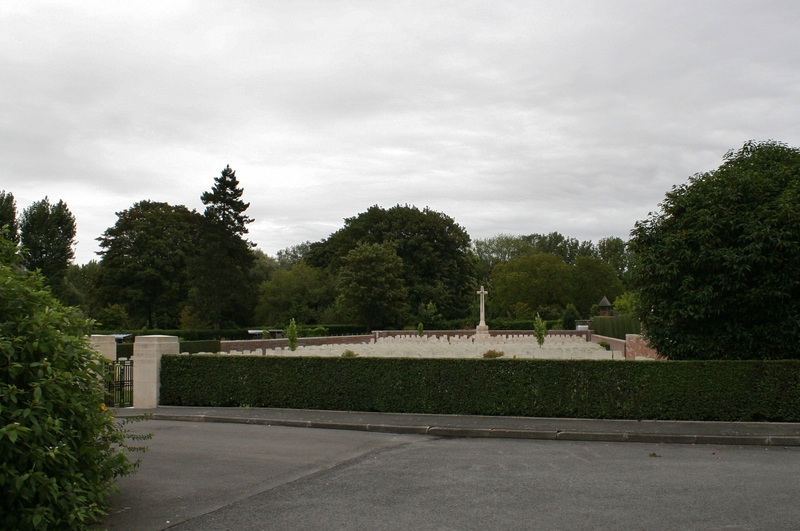 Panoramic view of the cemetery. 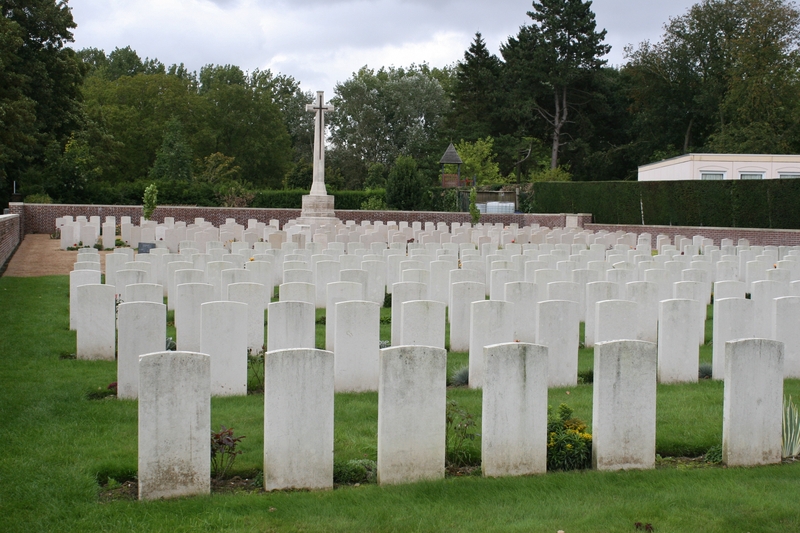 The cemetery was begun in April 1915, the earliest burials being made in what is now Plot I Row A (foreground above). 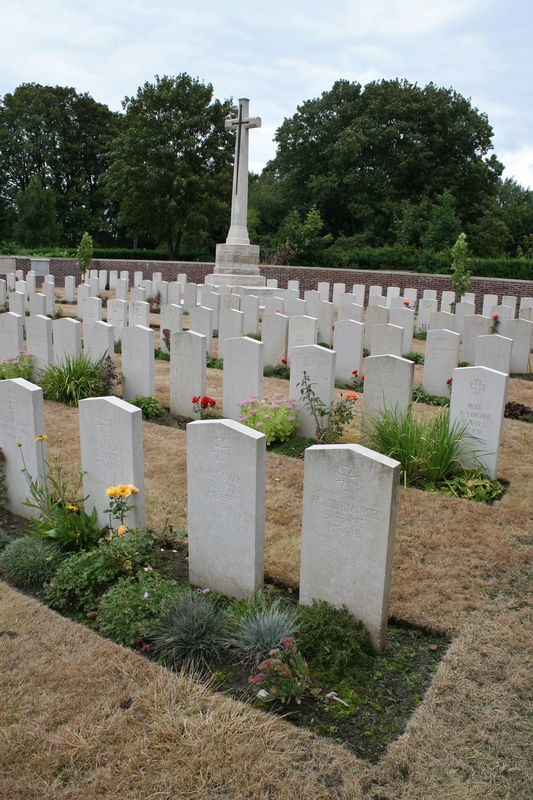 As with many of the cemeteries we have visited where the nearby front lines remained unchanged throughout much of the war, this cemetery was used on a regular basis until the spring of 1918, the headstones in the succeeding rows bearing more dates from 1915 right through to 1918, the later burials at the far end of the cemetery. 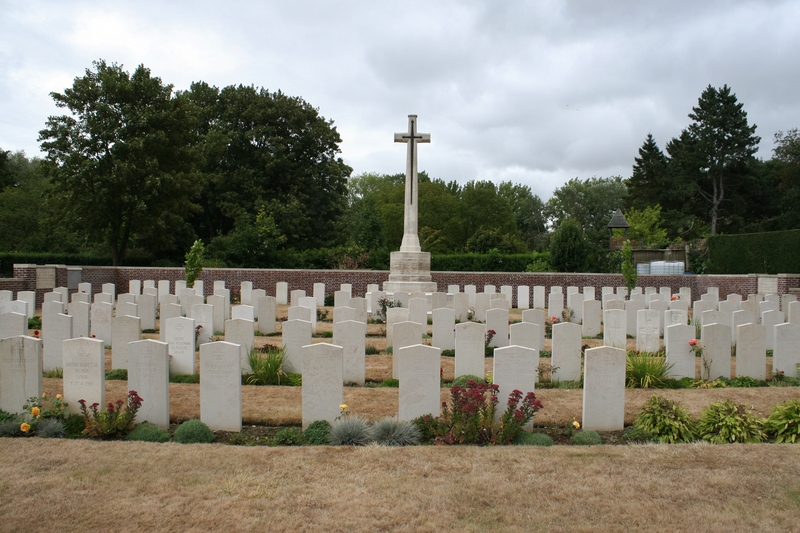 The first burials in Erquinghem-Lys itself, however, were made between October 1914 and January 1915, when 27 men were buried in the village churchyard. Much later, in 1925, when the churchyard was closed, the burials were moved here, and can now be found in Plot II Row G & Plot III Row G. I suppose you want a look at the cemetery plan now, as ever courtesy of our friends at the CWGC. 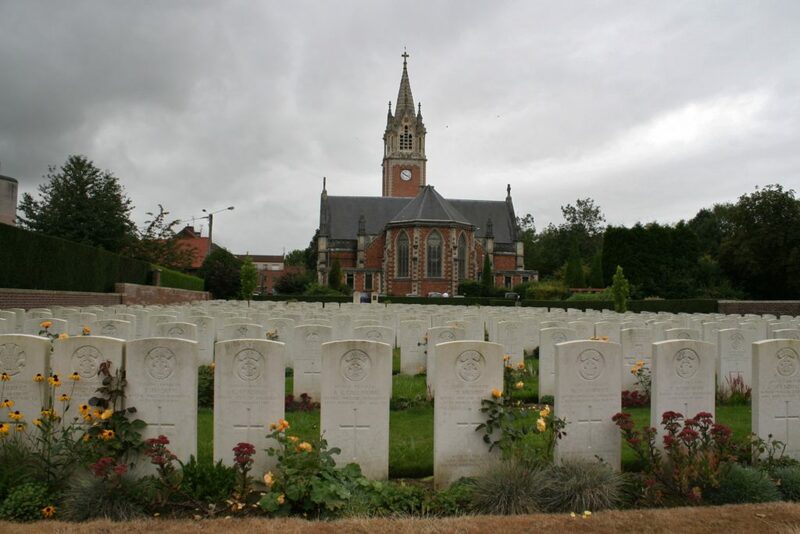 Presumably, by April 1915 the British had realised that the churchyard could no longer hold the numbers of dead being brought there to be buried, at which time this cemetery was opened. 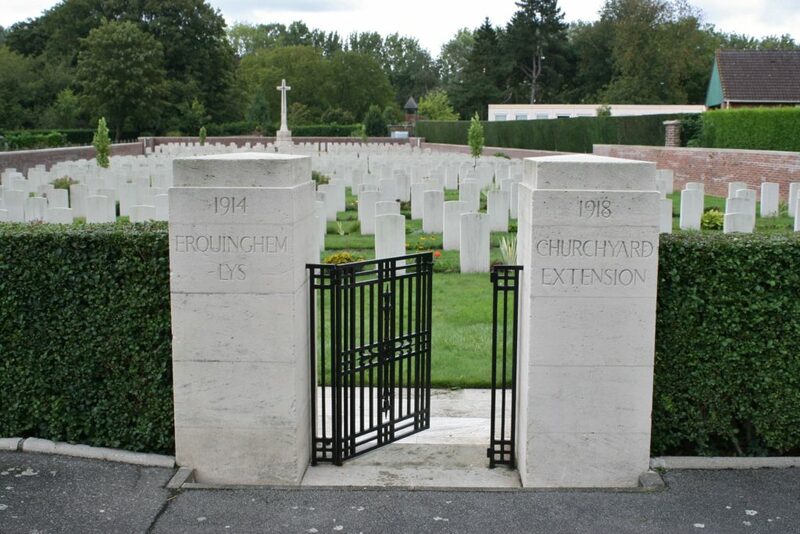 Hence the name: Erquinghem-Lys Churchyard Extension. 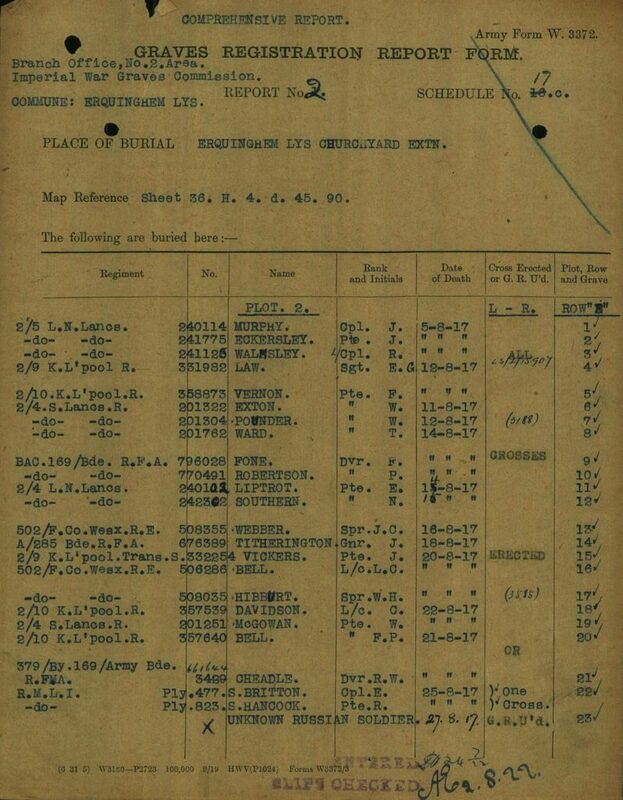 …all but two killed between 12th & 23rd April 1918. 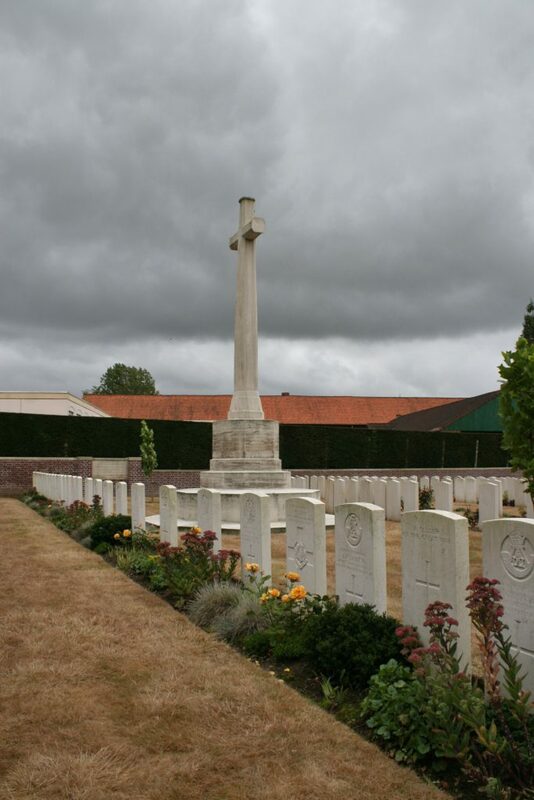 The cemetery, and indeed Erquinghem-Lys itself, remained in British hands for three and a half years before the German offensive of spring 1918 saw them take the town on 10th April 1918. 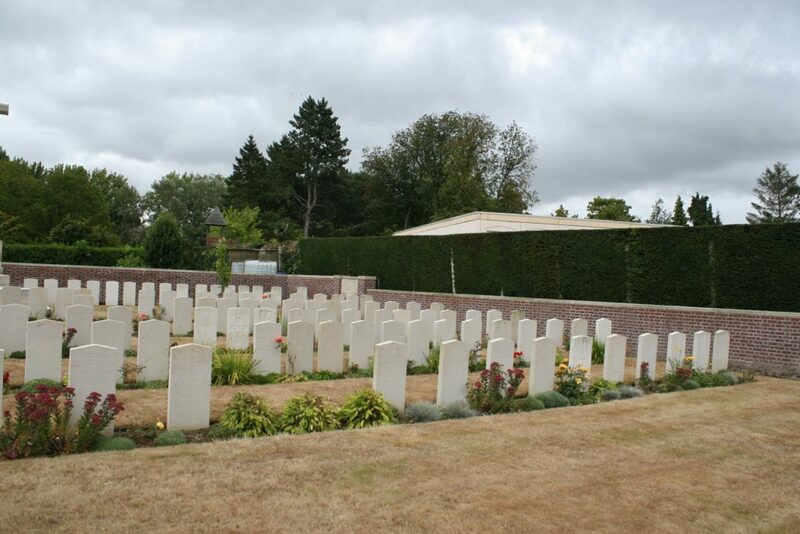 The Germans then used the cemetery themselves for the following fortnight before the tide of war moved on. Just eight of the burials here are unidentified, one visible in Plot III Row G above which, you may remember, contains many of the graves moved here from the nearby churchyard after the war. 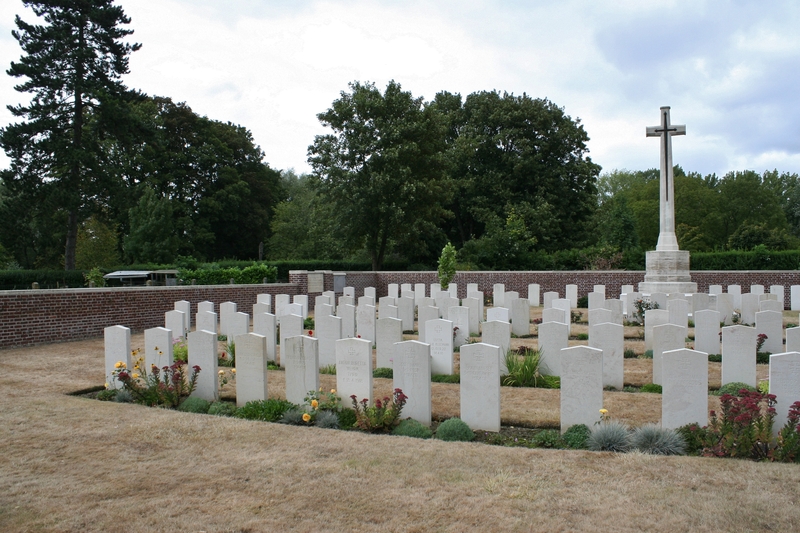 As the war neared its end and the Germans retreated, the cemetery was once again used by the British in September & October 1918, when a few more burials were made here (there are nine British burials from the autumn of 1918 in the cemetery, although it may be that one or two of these were originally buried elsewhere and moved here post-war). 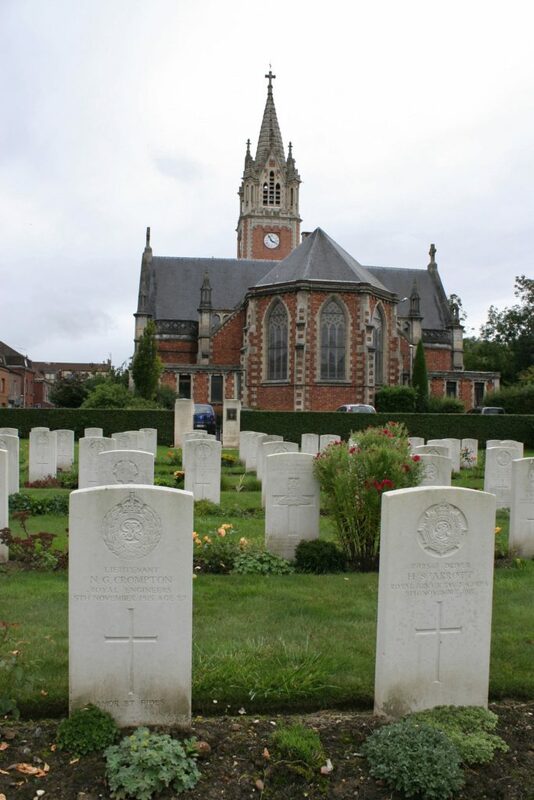 Private R. Burton, King’s Own Scottish Borderers, who died on 12th October 1918 (above left) was the final burial (or at least the latest date) in the cemetery in Plot III Row G; nearly four years separate his death from that of Private John Jackson, Leicestershire Regiment (above right), one of the men originally buried in the churchyard and moved here in the 1920s. Looking north west along Plot III Row G. Whatever Baldrick is doing at the far end of the row is not what it appears. Honest! 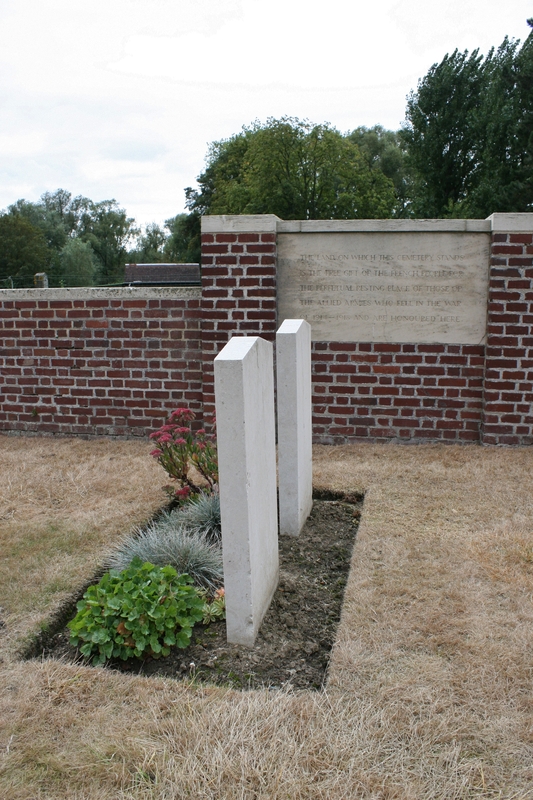 Two more German graves stand in front of the ‘In Perpetuity’ tablet inlaid into the boundary wall. 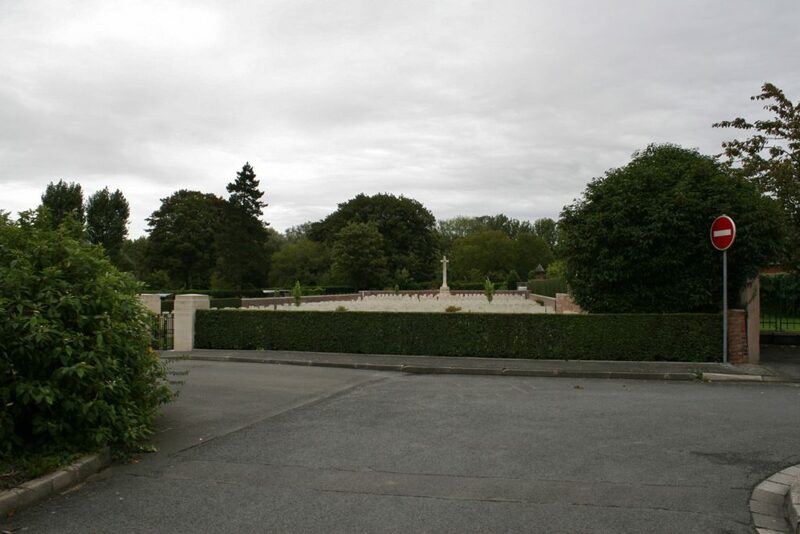 Looking south west down the cemetery, the German graves in Plot III in the foreground. 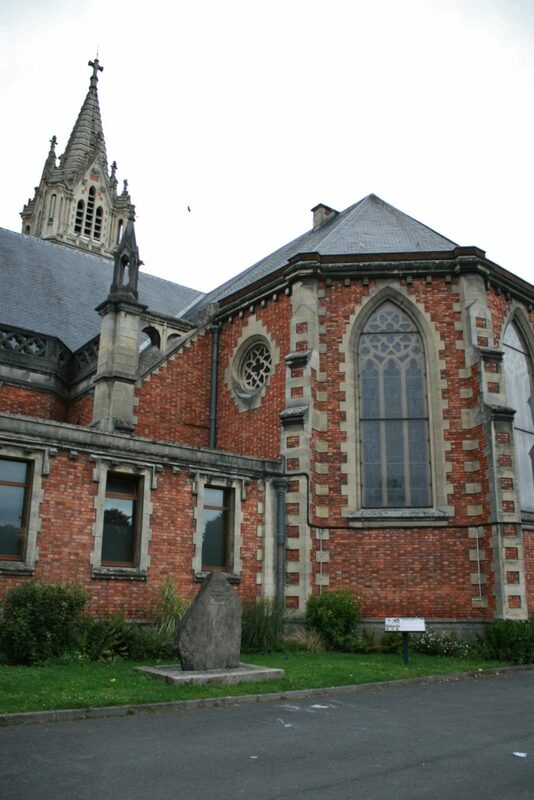 The River Lys, by the way, flows from right to left almost immediately behind the church. 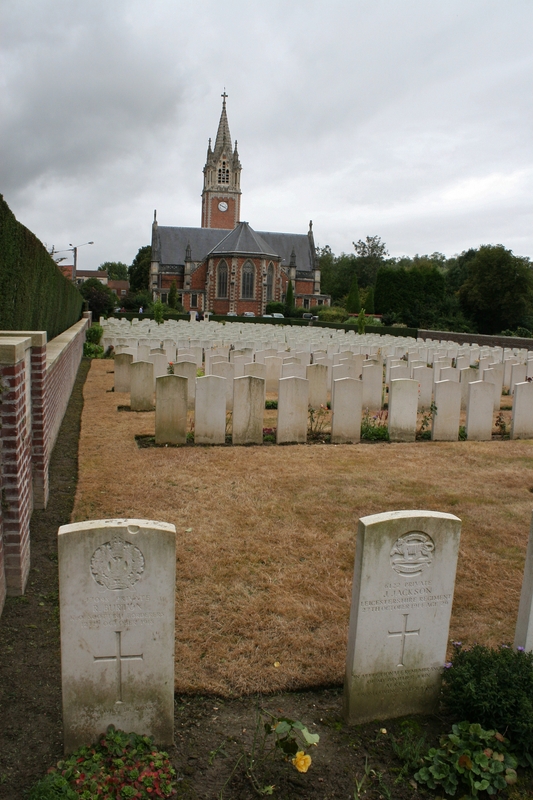 Welsh graves in Plot II Row H (above & below), all killed in March 1918. There are actually more men of the Royal Welch Fusiliers, seventy seven, buried here than any other regiment of the British Army, some dating from the summer of 1915, although the majority were killed between September 1917 and March 1918. …and panning right, Plot I and the cemetery entrance in the background. 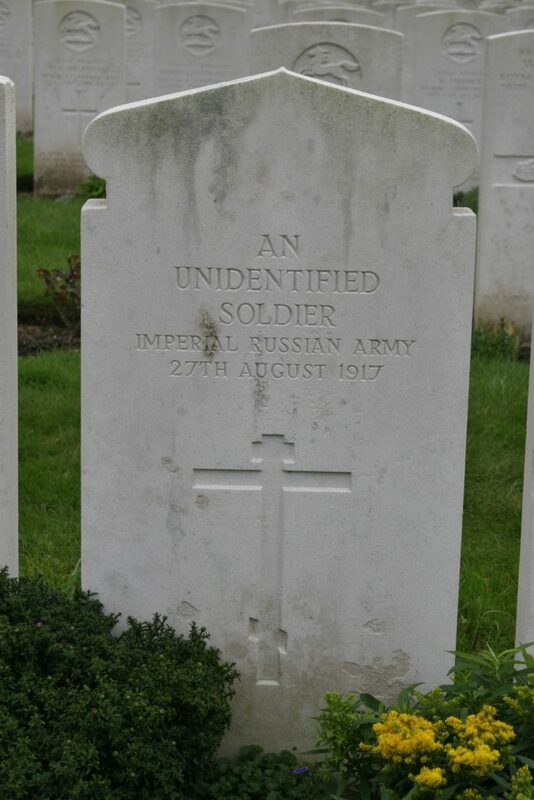 For some strange reason, a single unidentified Russian soldier is buried in Plot II Row E (with one of only two Canadian casualties to be found here in the row behind). On the left, Private Ralph Hancock M.M. 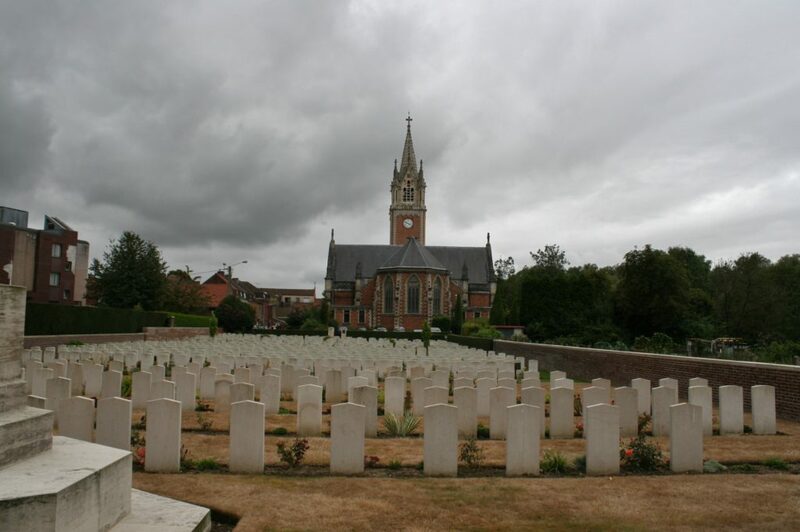 is one of only two men of the Royal Marine Light Infantry buried here; the other is buried alongside him (mainly out of shot to the left), both died on 25th August 1917, and both bear the same grave reference number of Plot II Row E22, for reasons which, well, you can decide for yourselves. Here’s a clue. 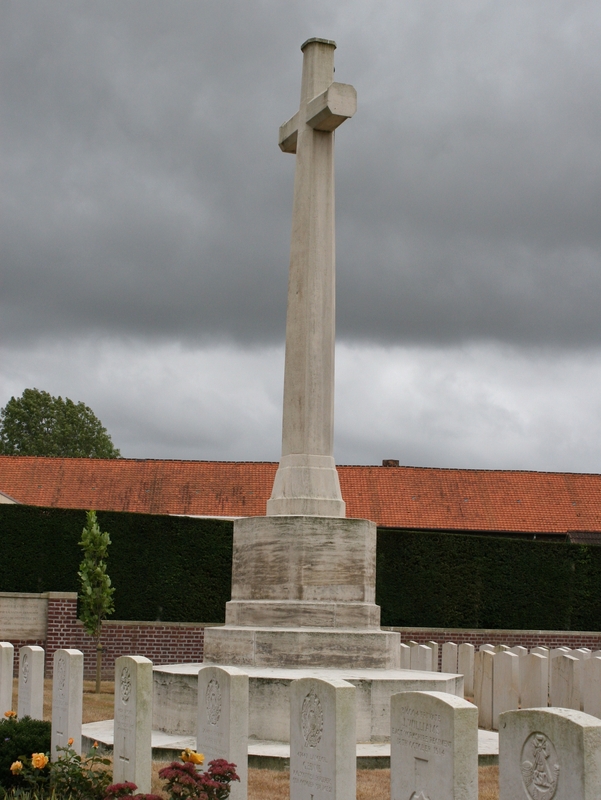 It seems that they were originally buried beneath one cross. 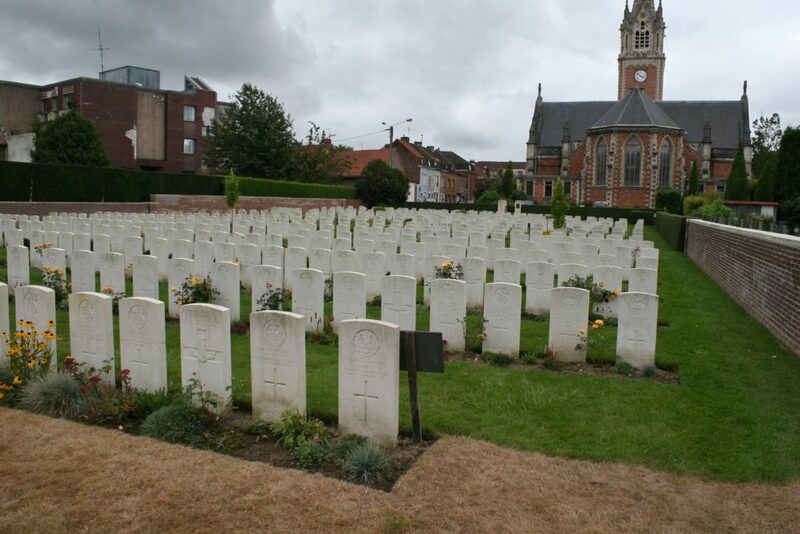 The graves visible in the background are all men of the King’s Liverpool Regiment. 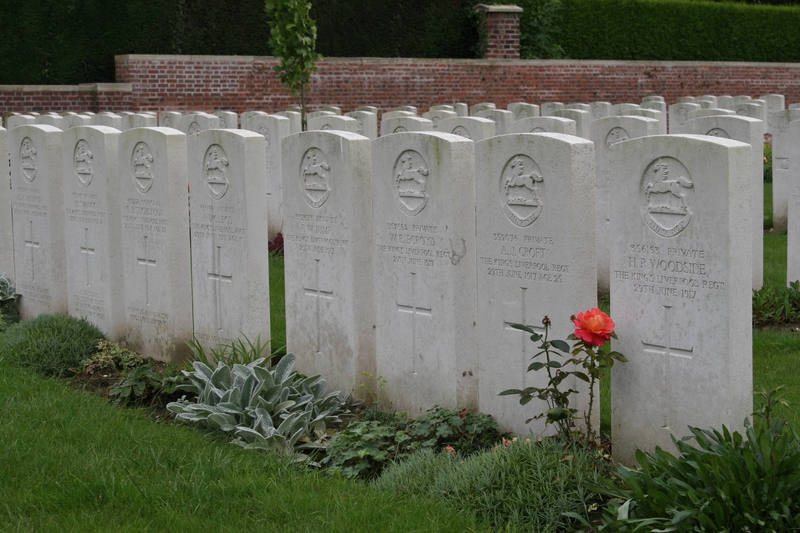 More King’s Liverpool Regiment men in Plot II Row C. These are men of the 2/10th (Scottish) Bn. 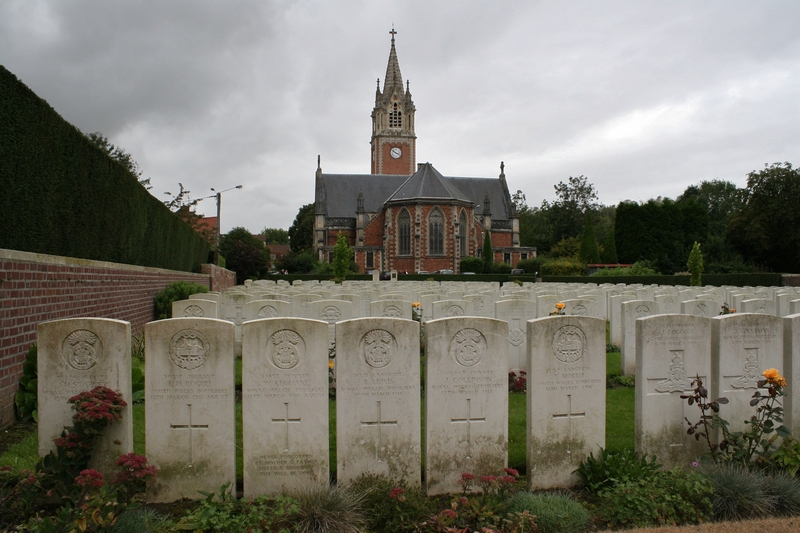 who were killed during a large daylight raid on the German trenches on 29th June 1917 that became known as ‘Dicky’s Dash’, after one of their officers, Captain Alan Dickinson M.C. The raid took place near Bois Grenier, a short distance south of here, at a point in the lines known as the Bridoux Salient. 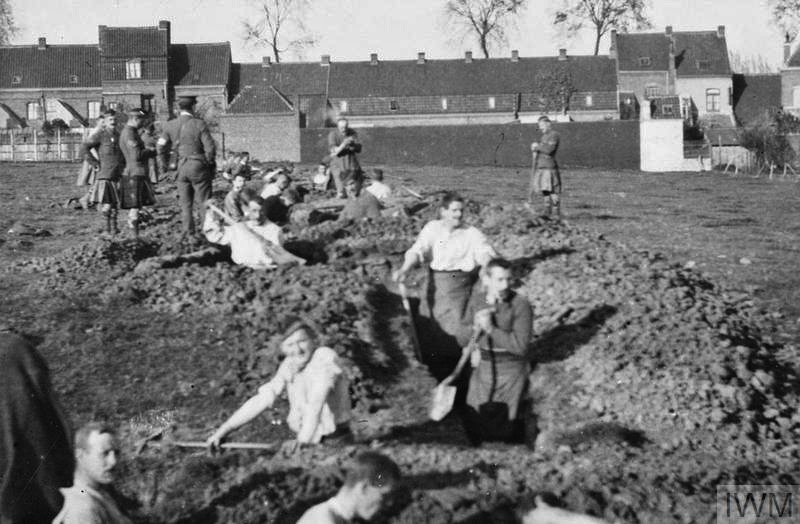 Although the British managed to gain a foothold in the enemy front line, determined German resistance caused heavy casualties both in their trenches and as the British returned across No Man’s Land to their own lines. In total 72 men of the King’s Liverpool Regiment, who held the line nearby, with their headquarters here at Erquinghem, between March and September 1917, are buried in the cemetery. 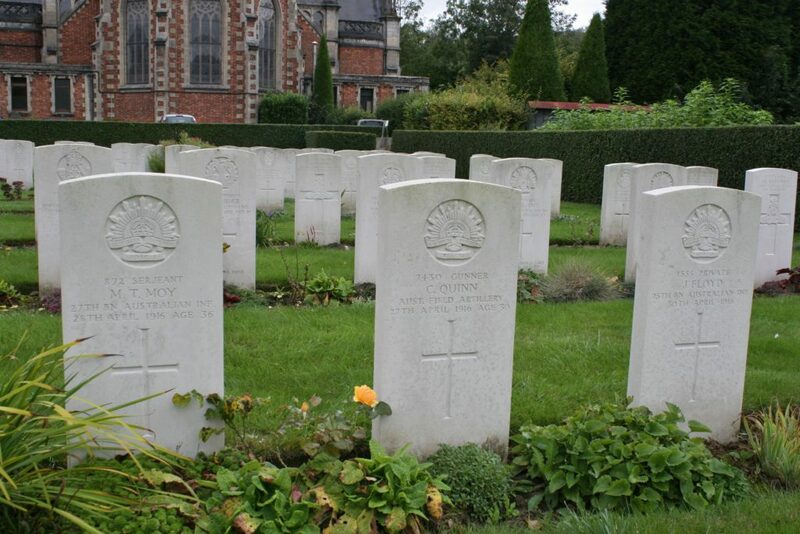 There are just three New Zealand graves in the cemetery, one in the front row above. 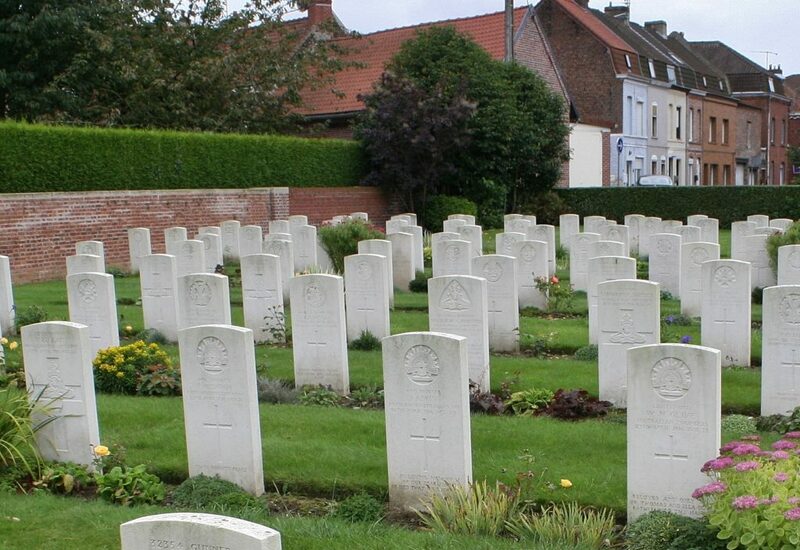 This is a close-up of the previous picture, and right in the centre, five rows back, next to the small green bush, you can see the only German graves that are not with all the others in Plot III. 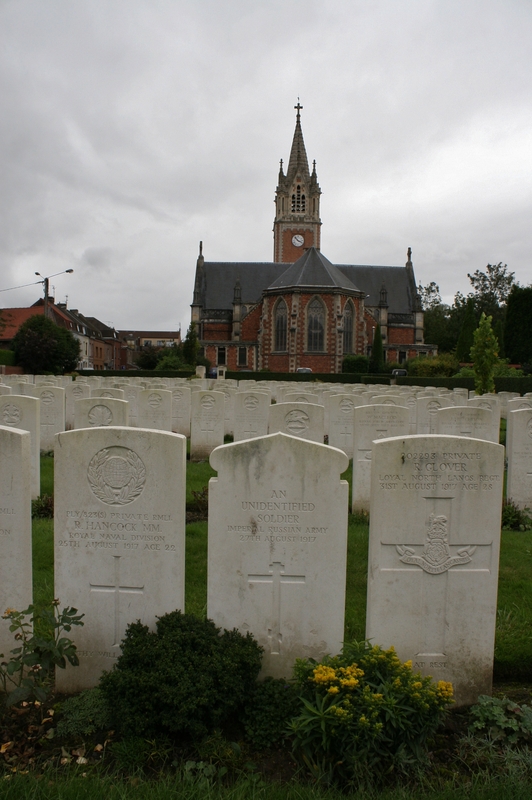 There are two headstones, belonging to Leutnant Oscar Teichmann & Flieger Josef Suwelack, whose plane, flying from an aerodrome near Lille, was shot down over Armentières on 13th September 1915. 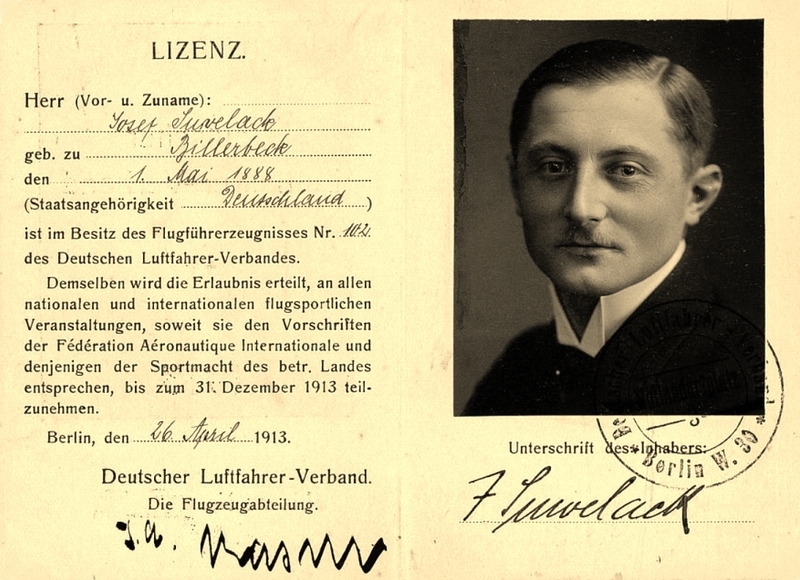 Josef Suwelack had been an aviator and aircraft designer before the war and was quite famous in Germany as he had set a flying world record in 1911. His flying licence (above) has the extremely early number of 102. By the autumn of 1915 Suwelack appears to have suspected, perhaps understanding the dangers of combat flying more than most, that his days were numbered; I have read that, shortly before his final flight, he had written a farewell letter to his wife and children. 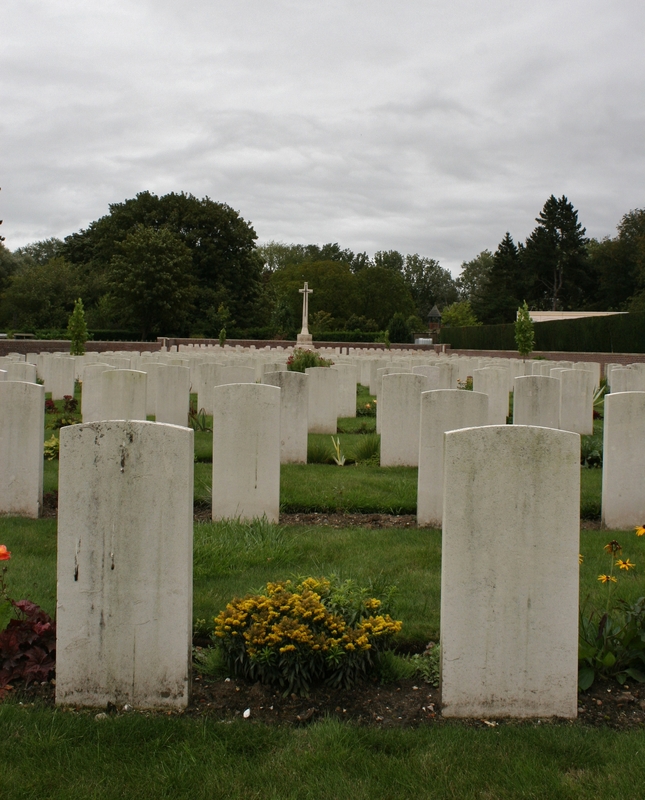 Thirty two Australians were buried here between April and early July 1916. 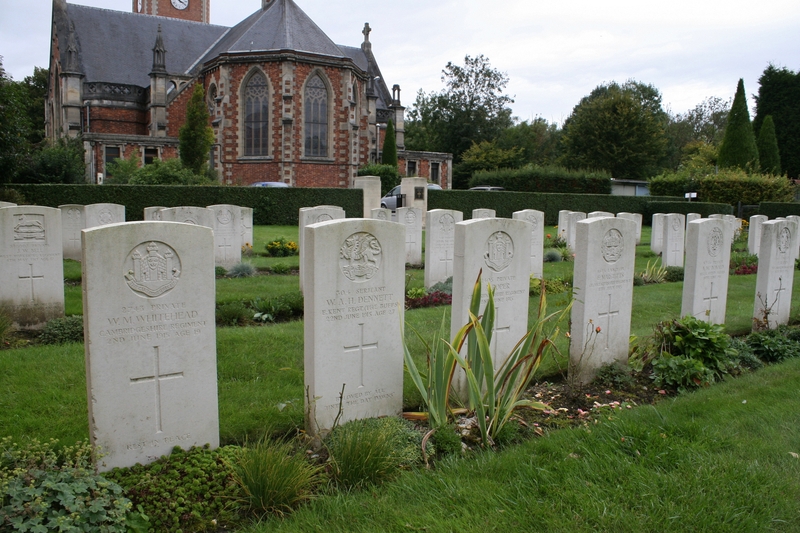 Casualties from November 1915 in Plot I Row F. Two rows back, behind the bush, three serjeants of the Royal Army Medical Corps lie side by side, killed on 27th June 1915 by a German shell as they were fishing in the nearby River Lys. 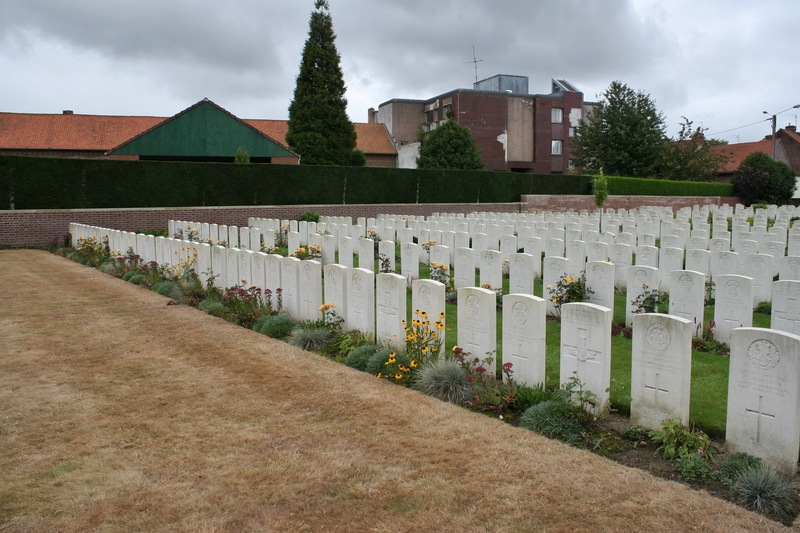 I have returned to Erquinghem since to photograph the graves of Josef Suwelack and the three serjeants, and there’s a link at the end of the post to this more recent visit. 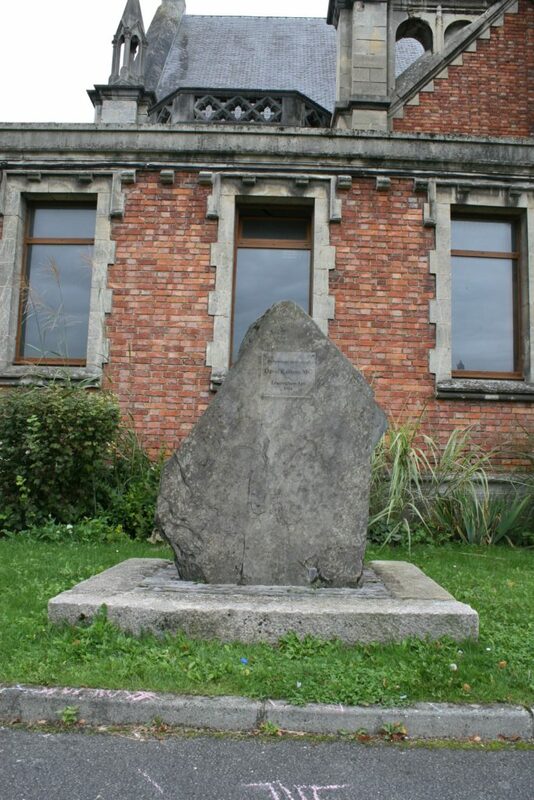 By the end of the war, Erquinghem-Lys had been razed to the ground, and the post-war rebuilding, as in so many towns and villages from the English Channel to the Swiss frontier, would begin. And that, you might think, is that. Not so. Before we leave Erquinghem-Lys (and we shan’t be going far, as there is a second, much smaller, cemetery in the fields immediately to the south), there’s a very important memorial in front of the church that we would be remiss to miss (!). 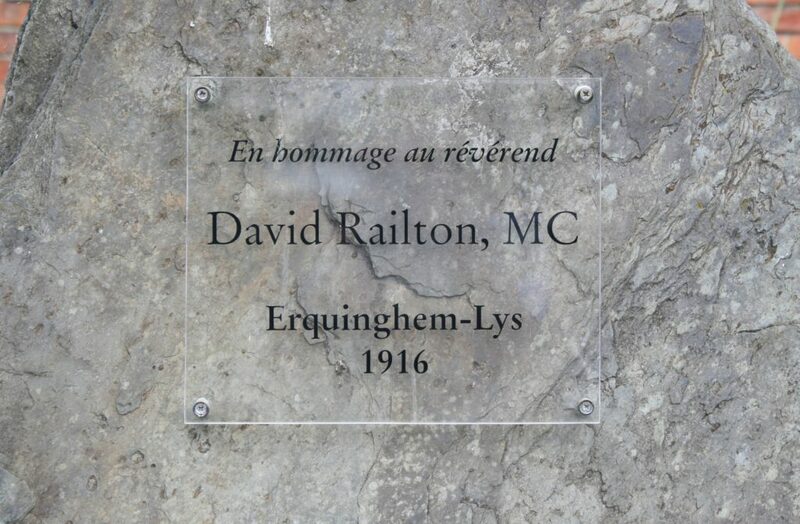 The Reverend David Railton M.C. 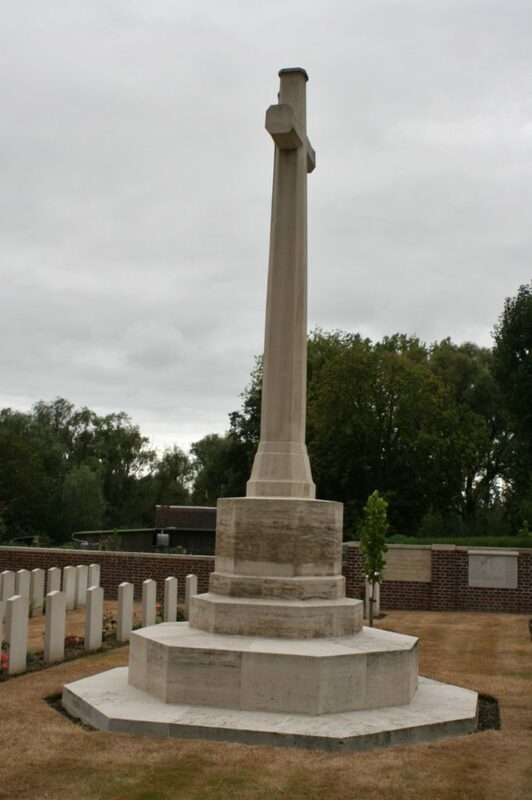 *, chaplain to the 2nd Battalion of the Honourable Artillery Company, was based in Erquinghem-Lys in 1916 when, as he later explained, on passing a wooden cross to an unknown British soldier, he was struck with an idea that he felt would ensure these men were never forgotten. *He won his Military Cross for rescuing an officer and two men under heavy fire. 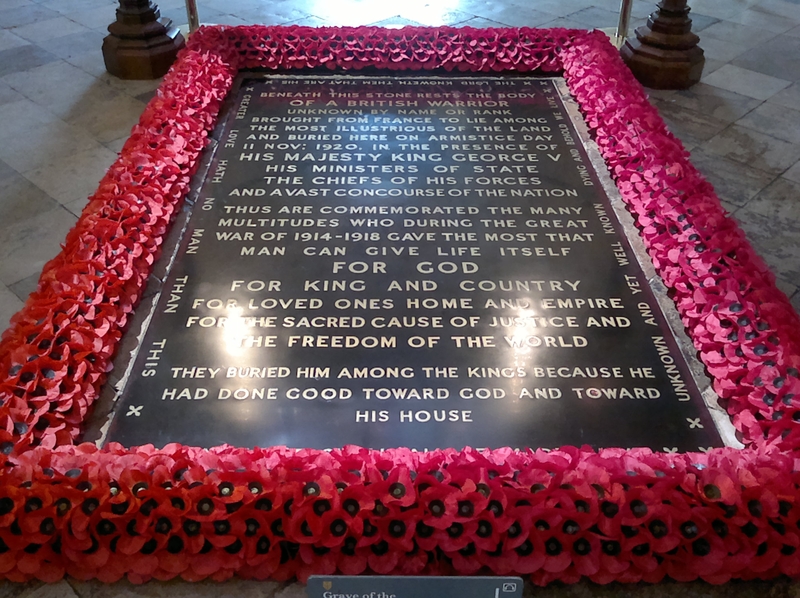 …and the rest, as they say, is history (I’ll show you some further shots taken at Westminster Abbey one of these days). 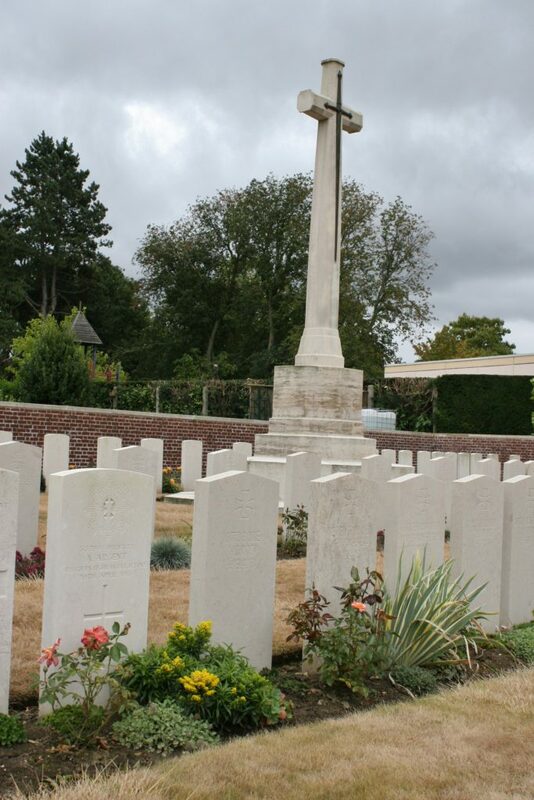 As a footnote, one wonders what happened to the body of the Black Watch soldier, as there are no men from the regiment buried at Erquinghem-Lys; it may very well be that he is one of the handful of unknown men now buried in the cemetery, his regiment no longer remembered. Before we finish, I discovered some interesting photographs (all copyright the Imperial War Museum) showing the British Expeditionary Force in Erquinghem-Lys during the first winter of the war. Argyll & Sutherland Highlanders digging support trenches at Erquinghem-Lys, some time in October or November 1914, while the First Battle of Ypres was raging a few miles to the north (© IWM(Q 50225). 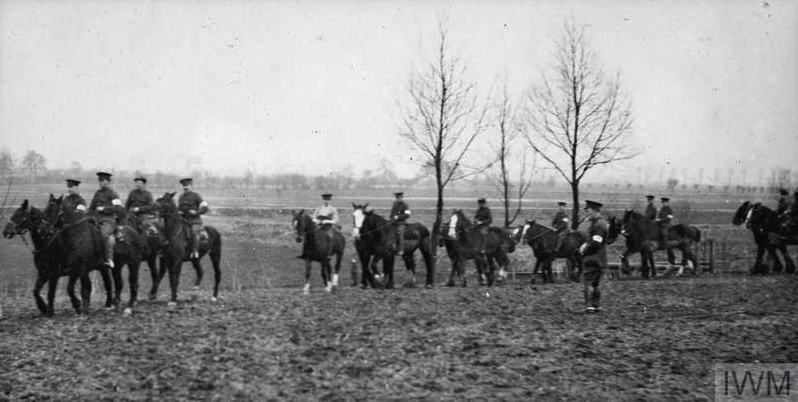 Dated November 1914, this scene shows men of 18th Field Ambulance, 6th Division, exercising their horses at Erquinghem-Lys (© IWM(Q 50288). 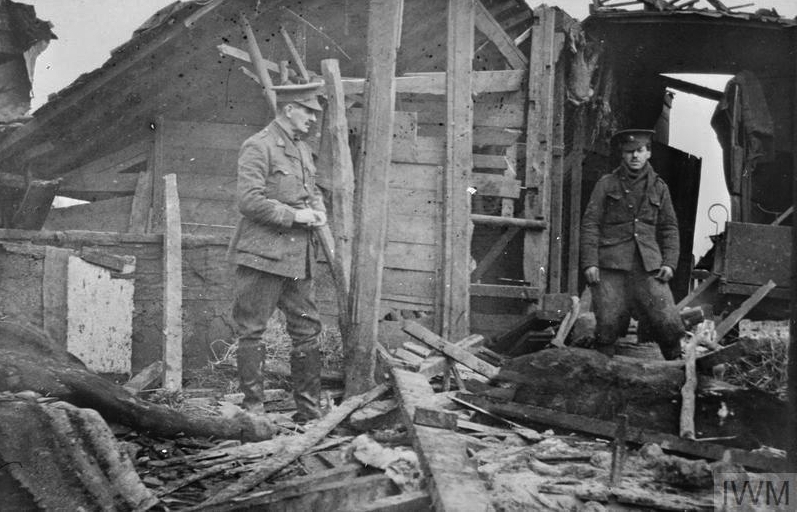 This photograph, also dated November 1914, shows the damage made by the first shell to land in Erquinghem-Lys, which demolished the stables pictured, killing the two horses (left & right), but leaving the driver, who was standing between them grooming them at the time, untouched. Lieutenant Colonel A. A. Watson, commanding officer of the 18th Field Ambulance, 6th Division, is surveying the damage in the centre of the photo (© IWM (Q 50226). 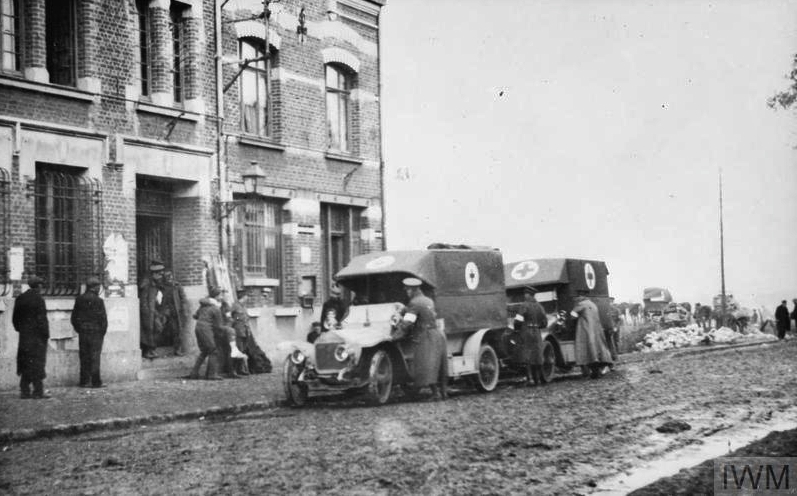 Horse and motor ambulances, 18th Field Ambulance, beside the Mairie, Erquinghem-Lys, January 1915 (© IWM (Q 50290). 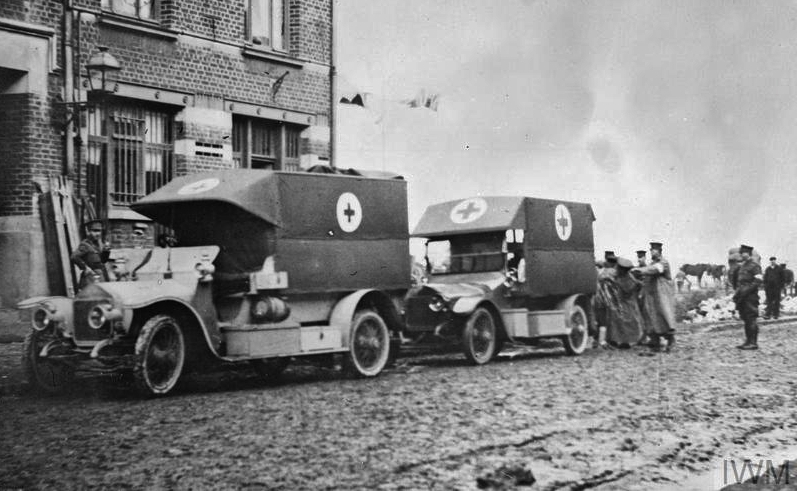 Horse ambulances of 18th Field Ambulance after discharging sick and wounded at the Mairie, Erquinghem-Lys, January 1915 (© IWM (Q 50289). 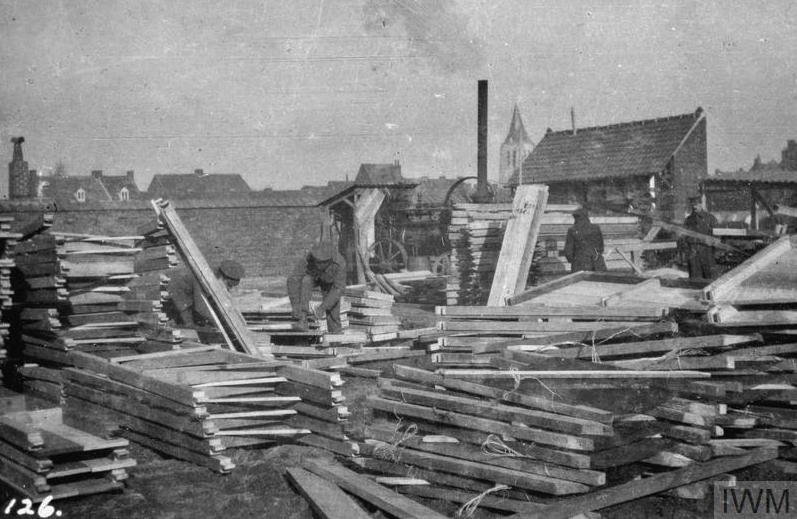 Piles of dug-out frames in the Royal Engineers’ yard at Erquinghem, 7th February 1915 (© IWM (Q 51574). 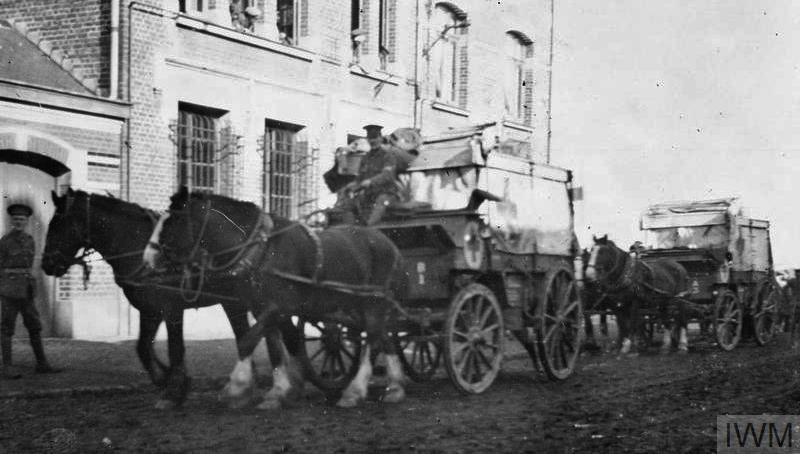 Loading wounded from the Mairie at Erquinghem-Lys to ambulance wagons, March 1915. 18th Field Ambulance (© IWM (Q 50228). 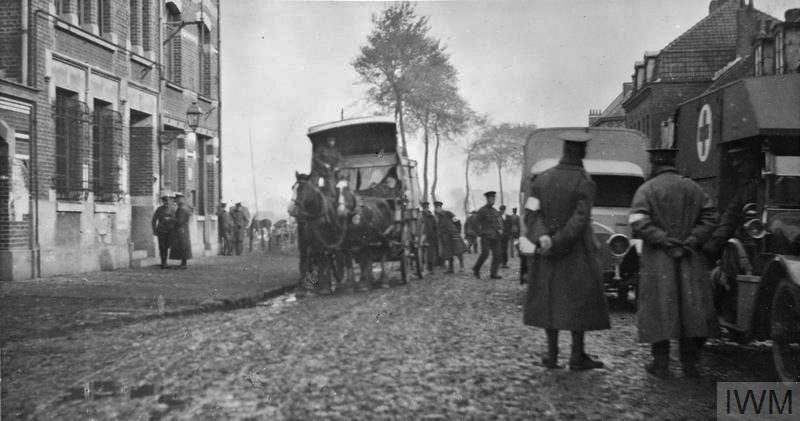 Although the original caption to this photograph says, ‘Loading sick and wounded on to ambulance wagon from the Mairie at Erquinghem-Lys to the casualty clearing station, February 1915’, it’s pretty clear that this photograph was taken at the same time as the previous one (© IWM(Q 50227). 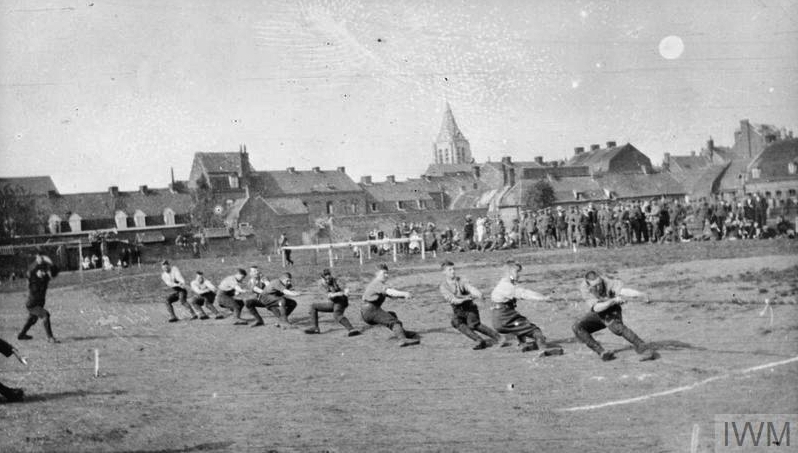 Men of the 18th Field Ambulance engaged in a tug-of-war at a sports event, Erquinghem, March 1915 (© IWM (Q 50229). 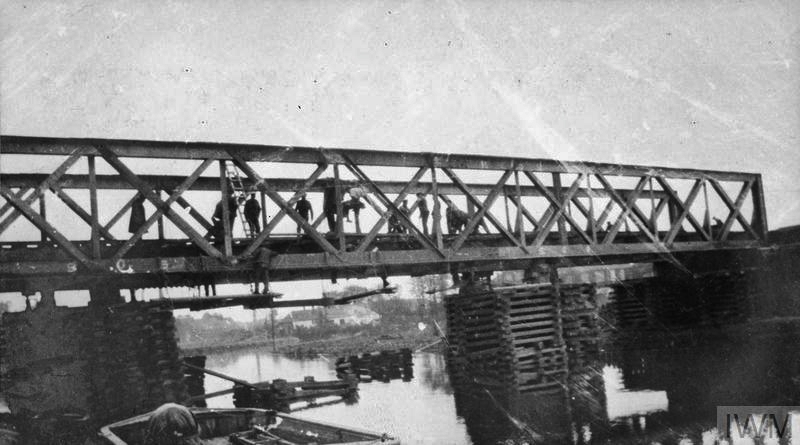 Above & below: Broken bridge over the canal near Erquinghem-Lys being repaired by Royal Engineers, 6th Division, April 1915 (© IWM (Q 50293) & (Q 50292). 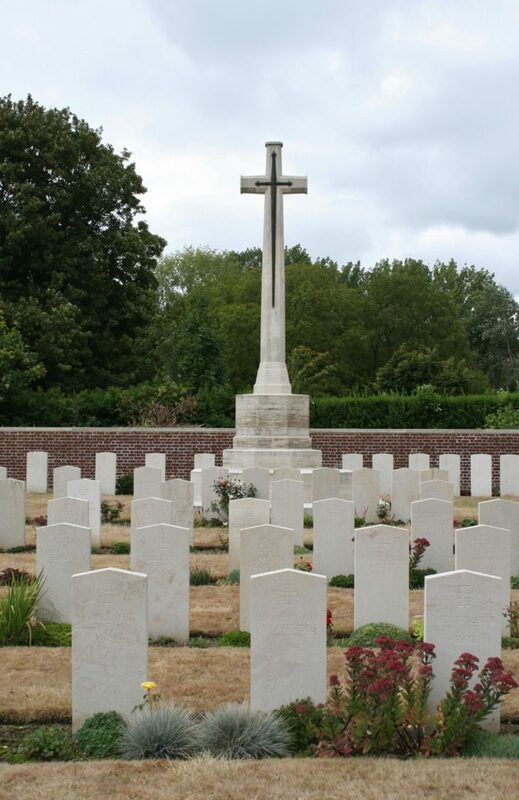 As I mentioned earlier, there’s another, much smaller, cemetery a very short distance south of Erquinghem-Lys that tells a tale of the German advance in the spring of 1918, and it’s there that we are heading next. 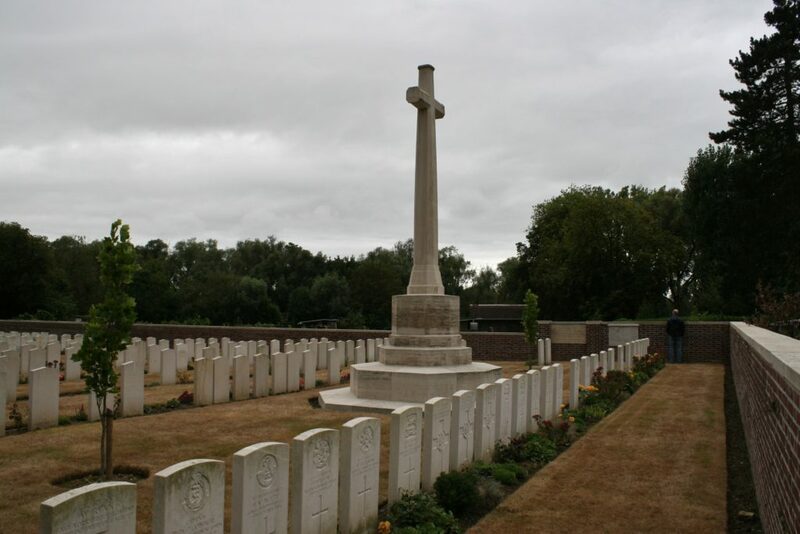 So don’t miss our visit to Suffolk Cemetery, but you can also see our return to Erquinghem-Lys Cemetery Extension here, if you wish. Thank you for another insightful chapter in your ongoing series MJS. As always, your stories teach me ever more about The Great War in which my father participated and for that alone, I am grateful to you. I found the Easter Uprising series also tremendously informative. Your attention to detailed research is impressive and what’s more …… I look forward to more of your incredible work and photography throughout 2017. In the meantime a Very Merry Christmas to you and yours and may the New Year bring much happiness, good fortune plus successful travels. Cheers Sid my friend. Glad you enjoyed the Easter Rising posts, by the way. Have a great New Year and we shall doubtless ‘speak’ again soon. I conducted a memorial ceremony to a Tyneside Scottish Officer, Lt Basil Catto, a few years ago. Thank you for sharing information and pictures from the Cemetery. Ian, thank you so much for commenting – I have read the account of the ceremony on your website. 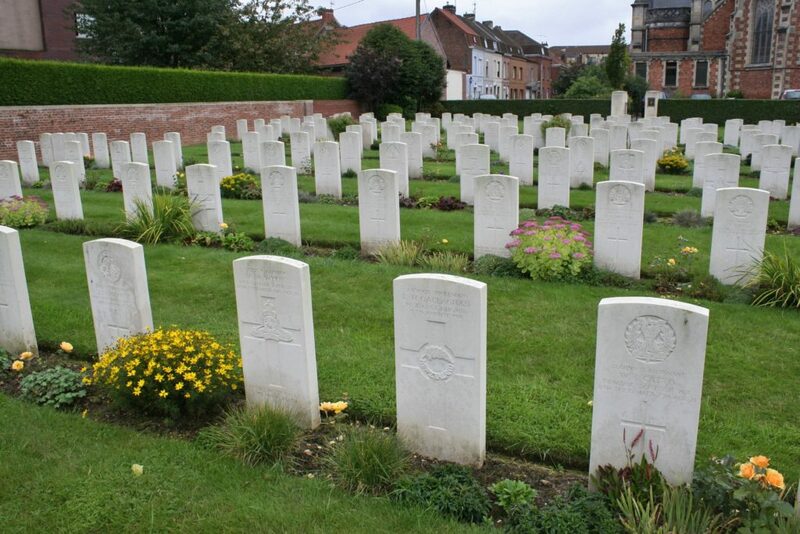 I hope to return to Erquinghem in a couple of weeks time, and I shall pay my respects at Lieutenant Catto’s grave if I do.